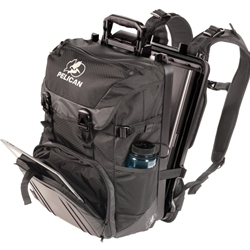 The Pelican ProGear S100 Sport Elite Backpack has a built-in watertight, crushproof case which measures 15.15" x 10.40" x 1.00" and is top loading to give you quick easy access while on the go. Other features of this backpack include; SureGrip soft rubber handle, rigid front plate, bottom expanding sling storage, load compression straps, a top loading 25 liter main storage compartment, chest clip and removable hip belt along with floating shoulder straps and lumbar pad with ergonomic ventilated back. Available Colors: Black on Black (Usually in stock in Denver), Green on Black, Orange on Black and Grey. Exterior Dimensions18.50" x 13.00" x 10.00"
Shipping Dimensions23.00" x 16.00" x 14.00"